John's music covers a wide variety of genres from opera to solo instruments. 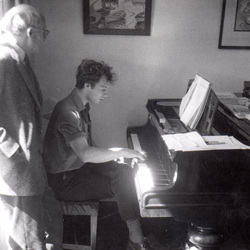 He studied composition with Frank Spedding at the Royal Scottish Academy of Music (now the Royal Scottish Conservatoire) and, with the help of a Caird scholarship, went on to study with Michael Tippett and Hans Gal. The review below gives some idea of the breadth of his output, and a selected list of compositions is in the drop-down menu. The photo, from the 1970s, shows his patient father listening to John's latest noisy effusion at his parents' home in Dublin. Note the refined use of the pedals! The Cuillins, in the image above, have been a source of inspiration for many of John's compositions, especially some of those on the CD Dreaming of Islands JWP 010.
. . . it seems to speak of the deep history of Scotland. The mood and sound is timeless. Purser's piece is a set of variations, superbly played here by Bonnie Rideout. The structure of the music is tight, making use of themes which are interrelated and utilises interesting contrapuntal devices. The overall effect of this music is gentle and quite beautiful. . . It is a strangely effective piece that alludes to the mystery of the ‘dramatic coastal scenery of the Isle of Skye’. This makes for an inspired combination of instruments. It is a dark, slow, introverted piece that has considerable magic. Sonically it is magnificently memorable; musically it is mightily touching. It is a poignant and effective way to close the disc. This piano duet is full of interesting rhythms and twists and turns to the melodies. The harmonies are wayward, the tunes obvious, but always having an edge. This is an altogether fine and exciting piece. There is a French flavor to much of this, and there is much fun to be had too (the “March” is describing the clowns, for example). It is beautifully played by Hutchison and Keaney; the finale has just the right amount of raucousness, described by the composer as “roundabout music”. You'll see what he means when you hear it. I was impressed with the beautiful and intense ‘Suite’ for solo violin. . . . It is one of the most impressive - and intellectually satisfying - pieces on these three CDs. . . . This is a concentrated work that repays repeated listening. Purser’s Suite for Unaccompanied Violin may just be the most beautiful music written for violin solo since Max Reger and Eugène Ysaÿe put their minds to writing such pieces in the early 20th century. I’m not suggesting that Purser’s Suite sounds anything like the works by either of those composers, but his writing for the instrument places him in the tradition of Bach and those who adopted a similar approach to composing for solo instrument, which is to say that the music is very difficult technically because it is so thoroughly contrapuntal, not because it’s virtuosic in a flashy way. Rachel Barton Pine, who has surely risen to the top rank among today’s violinists, plays Purser’s Suite magnificently. The Suite for Unaccompanied Violin pays tribute to Bach, and uses Baroque dance forms as its basis (Saraband, Pavan and Variations, Prelude and Fugue, Gavotte). The well-known and well-respected violinist Rachel Barton Pine is the expert soloist, and as one might expect the performance is impeccable in all respects. The recording, too, is perfectly in service of the music; the violin is distanced just the right amount and there is just the right amount of reverberation. The pizzicato variation of the Pavan is particularly impressive, both in composition and in performance terms. Perhaps it is just me, but there seems to be a Scottish tinge to the abandon of the final stretch of the work. the almost heartbreaking Saraband in this violin suite, followed by a Gavotte that gradually accelerates towards an exhilarating finish.
. . . is dedicated to Mnemosyne, the Greek Goddess of memory. The charming set of memories is beautifully performed by Ronn MacFarlane.
. . . an attractive set of four short pieces for the lute. This is a deeply-felt piece that explores a wide range of emotion in eleven short minutes. The work is typically reflective, but there are a few anguished moments. This beautiful Cello Sonata should be much better known and established in the repertoire. Brief but eloquent, it exudes peace. ﻿Bannockburn tells the story of a great Medieval Gaelic warrior-knight, Robert the Bruce, and his engagement in battle with the army of the English warrior-knight Geoffrey de Bohun. This is music of war, prayer by the Scots for victory, and the eventual celebration of Scotland’s winning of independent nationhood. It’s a fantastic symphonic tone poem, leaving one to wonder why it hasn’t been taken up on record before this.
. . . the dramatic score for Bannockburn, a programmatic tone poem on the famous Scottish defeat of the English, . . . The depiction of the cavalry charge (track 5) is given with all caution thrown to the wind by the brass players. The evidence of Bannockburn, the symphonic poem on one of the three CDs of his music, suggests you’d be bloody good at writing film music. the work exhibits, not unexpectedly, an atavistic, neo-primitive style which is both brave and compelling. The second [movement] is a slow and magical exploration of sounds . . . The composer's own description of the scoring as for a “tiny but most imposing” ensemble is entirely correct. I love the expressivity of John Purser's music, and the way it is clear his compositions portray exactly what he wants. His writing is always expert and idiomatic. The Flute and the Cello Sonatas, the Suite for solo violin, and Carrier Strike (evacuated of its ‘programme’) are . . . equal to anything written at the same time by other composers.
. . . both academically interesting and viscerally appealing, perfectly demonstrating the difference between tradition-as-source and tradition-as-museum, although I sincerely hope a few tourists buy it by mistake. It is my sincere hope that this review will bring John Purser to the attention of a larger audience, and that more of his works will be recorded, for he is a composer of inestimable talent whose music deserves to be heard. Purser is not so easy to pigeonhole as a composer. He travels many roads, but in the end most of them lead back to the combined beauty and rawness of nature, regardless of his means of expression of the moment, folk or classical. A perfect example of this is the almost heartbreaking Saraband in this violin suite, followed by a Gavotte that gradually accelerates towards an exhilarating finish. Funding from Creative Scotland has allowed Scottish (reasonably enough) composer John Purser to release no fewer than three CDs of his music, a situation which may seem indulgent but which is redeemed both by the scope and variety of the material and the time-span it represents, ranging from the 1960s to recent works. Any bells that may be ringing might relate to his activities as a composer, to his tenure as the first manager of the Scottish Music Information Centre during the 1980s (which is when I first became aware of his work) or to his many other activities as a playwright, broadcaster and author of the acclaimed historical survey Scotland’s Music, a book I wish I could afford. As he has exceptional insights into his national tradition alongside a robust grounding in the conservatoire (Sir Michael Tippett was one of his teachers), the diversity of his output is perhaps unsurprising. Of the three discs, Dreaming of Islands is, as he states in the accompanying notes, the most obviously derived from traditional music, but don’t expect a tumult (I’m not sure what the collective noun should be) of jigs and strathspeys; instead, here’s a trio for strings and Bronze Age horn, nu-pìobaireachd for unaccompanied violin and flute, settings of Gaelic poetry and more besides. As a mixture it’s both academically interesting and viscerally appealing, perfectly demonstrating the difference between tradition-as-source and tradition-as-museum, although I sincerely hope a few tourists buy it by mistake (JWP 010, 59 minutes). Circus Suite is a pleasant enough mixture of instrumental music variously featuring violin, cello, flute, piano and lute (JWP 020, 1 hour 8 minutes), while the title piece on Bannockburn is a somewhat cinematic orchestral evocation of the famous battle. Despite its bombast it is in fact eclipsed by the second piece, written for soprano and percussion (and who better than Sarah Leonard and Joby Burgess, as here?) together with John Kenny on carnyx, a reproduction of a 2000-year old Celtic war trumpet; the work exhibits, not unexpectedly, an atavistic, neo-primitive style which is both brave and compelling (JWP 030, 39 minutes).